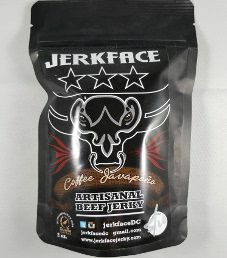 The next review for Jerkface will be on a 2 ounce/56 gram bag of their cleverly named Coffee Javapeno flavored beef jerky. 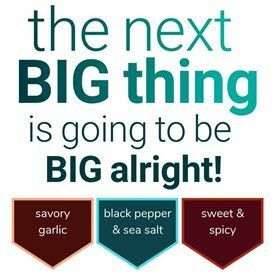 This flavor is described as being a collaboration with Qualia Coffee to put a little pep in your step. The jerky was graciously submitted for review by the owner, Eric Judycki. 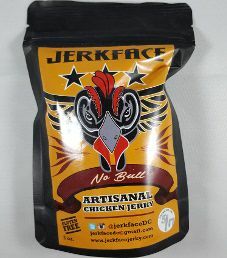 The next review for Jerkface will focus on a 2 ounce/56 gram bag of their cleverly named no bull flavored chicken jerky. This flavor is simply described as gluten free, no bull. The jerky was kindly submitted for review by the owner, Eric Judycki. 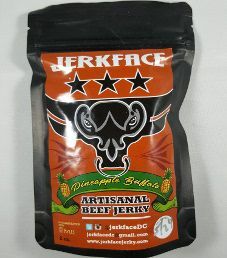 The next review for Jerkface will be on a 2 ounce/56 gram bag of their Pineapple Buffalo flavored beef jerky. This jerky is advertised as their first collaboration with 8 Myles, having hints of pineapple sweetness abound beneath that fine buffalo spiciness. The jerky was kindly submitted for review by the owner, Eric Judycki. 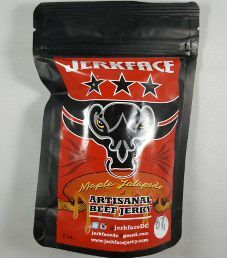 The next review for Jerkface will focus on a 2 ounce/56 gram bag of their Maple Jalapeno flavored beef jerky. This flavor is described as having a little seasonal sweet, and a little heat, made in DC! The jerky was kindly submitted for review by the owner, Eric Judycki. 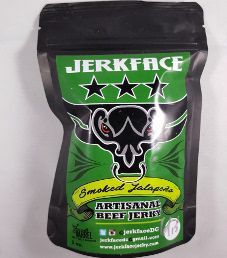 The next review for Jerkface will focus on a 2 ounce/56 gram bag of their Smoked Jalapeno flavored beef jerky. This jerky is advertised as a spicy collaboration w/ Chef Logan McGear of Smoke & Barrel, made in DC. The jerky was graciously submitted for review by the owner, Eric Judycki.